Category: American, Pub Grub & more…. Speciality: Bottled beers – 66 varieties! With 33 food choices on the menu and service all day, along with 66 different bottled beers from around the world, plus 3 ciders and 3 NA’s (also of International origin) and 16 draft beers available, spending a lazy afternoon here is not a hardship! I am a newbie when it comes to drinking brewskis but my hubby is not; having taste tested his way across Germany many years ago on a vacation trip, where we sped down the autobahn in our rented Beemer driving crazy fast just like a native and making stops for Pils between every town on our route! A beer lover’s Odyssey. HopMonk Tavern comes close to that memory, as hubby was duly impressed with the selections offered. He settled on a brew boasting it “tasted like bacon – smoky in flavor.” By golly, it did indeed taste like bacon. I opted for an NA Bitburger that was quite good. I wish more bars, pubs and restaurants would update their selections of NA beers. The menu here is pub food on steroids. Oh, they’ve got the usuals like Crispy Calamari, Sliders (pulled pork and burger variety), Garlic Fries and so on. But, they do them with panache. And their regular size burgers and sandwiches looked awesome as they passed by, leaving their aroma. Another visit? For starters, we opted for a cup of oven roasted Tomato Soup, blended with fennel, white wine and cream. Main dishes ordered were Mussels & Tavern Fries, with prosciutto, tomato, shallots, garlic, herbs, and cream, then finished with ale and butter! Fish and Chips, (had been recommended earlier by a friend) was beer-battered cod with tavern fries, a house made tartar sauce, and seasonal coleslaw. The only disappointment was the soup. Not enough salt was added to the roasted tomatoes during the cooking process. Tomatoes need lots and lots of salt, whether eating them raw or making a soup or sauce. Trying to adjust the seasoning afterwards is difficult. 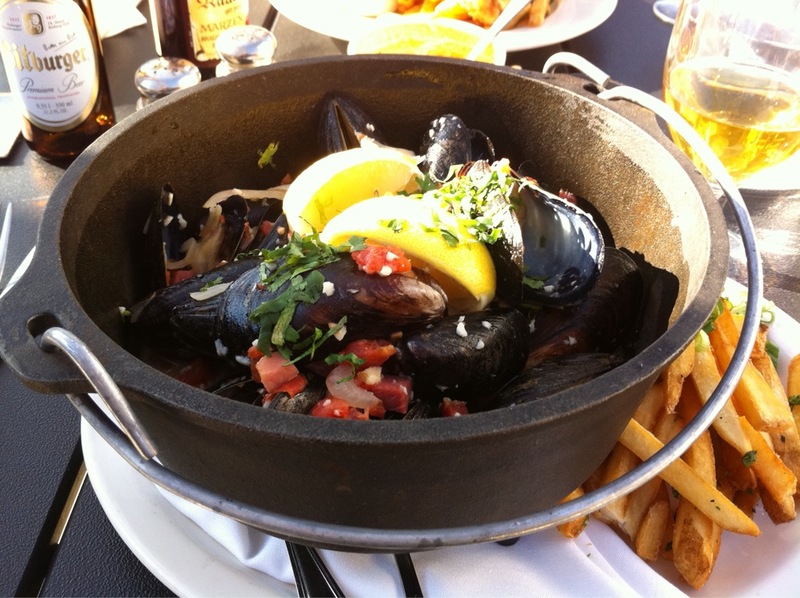 The Mussels and Tavern Fries were delicious. Excellent texture on the shellfish, and the broth was to die for with lots of diced-up prosciutto. The Fish and Chips was battered lightly and the golden color indicated it had been fried in clean oil. Too many times you get fried foods that are very dark in color – a sure sign the fry oil is old. My advice, don’t eat it. Very friendly wait staff and a crisp, sunny afternoon spent on their lovely patio eating good food, enjoying a lazy day. Life is good! Get Thee to HopMonk Tavern and grab yourself some California Pub Food at it’s best. Bonus. A second location in Sebastopol! Which was equally attention-grabbing at the same time as insightful!